If you've never tasted an oven roasted pear, be prepared to fall in love. Delicately flavored with lemon, vanilla, and brown sugar, they taste heavenly, make an elegant last course, and are ridiculously simple to make. Select pears that are not overly ripe, or too hard. Any variety will do, but if you can find these miniature Forelle pears (often available at the grocery store), do give them a try. I love their petite size and sweet flavor. Once the pears have roasted, allow them to cool slightly before serving. No further embellishments are needed. 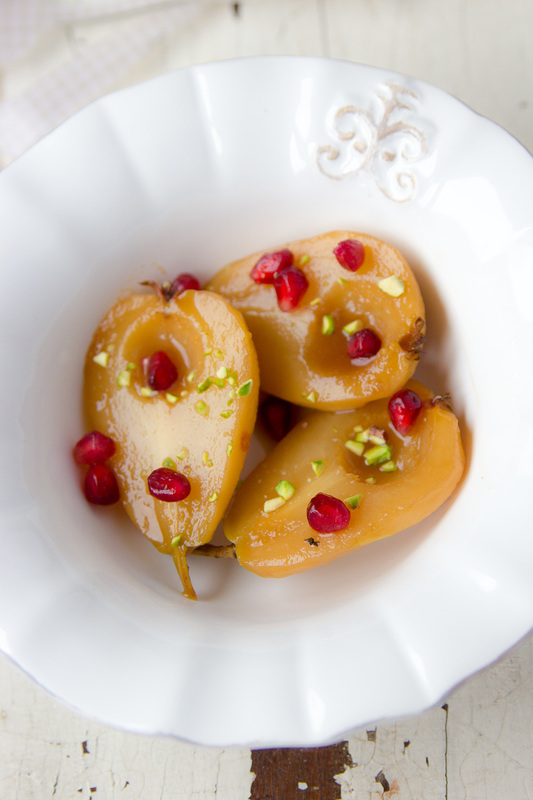 But a sprinkling of fresh pomegranate seeds and crushed pistachios over the pears do add a nice touch. Seeding a pomegranate can be a frustrating and messy job if you don't know what you're doing. This video demonstrates how easily it can be accomplished. Squeeze the juice of 2 lemons and set aside. Butter a 9 x 12 baking dish. Peel the pears and slice them in half lengthwise. Using a melon baller, scoop out the seeds. Dip the pear halves in the lemon juice to prevent them from browning, and place them cut side down in the pan. In a small bowl, mix together the apple cider, brown sugar, vanilla and the lemon juice. Mix well to dissolve the sugar. Pour over the pears in the pan and bake, basting occasionally for 30-40 minutes, or until tender but not mushy. Remove from the oven. Pour liquid into a saucepan and cook over medium high heat for 5-10 minutes until thickened enough to coat a spoon. Pour over pears. Serve either slightly warm, at room temperature, or chilled. 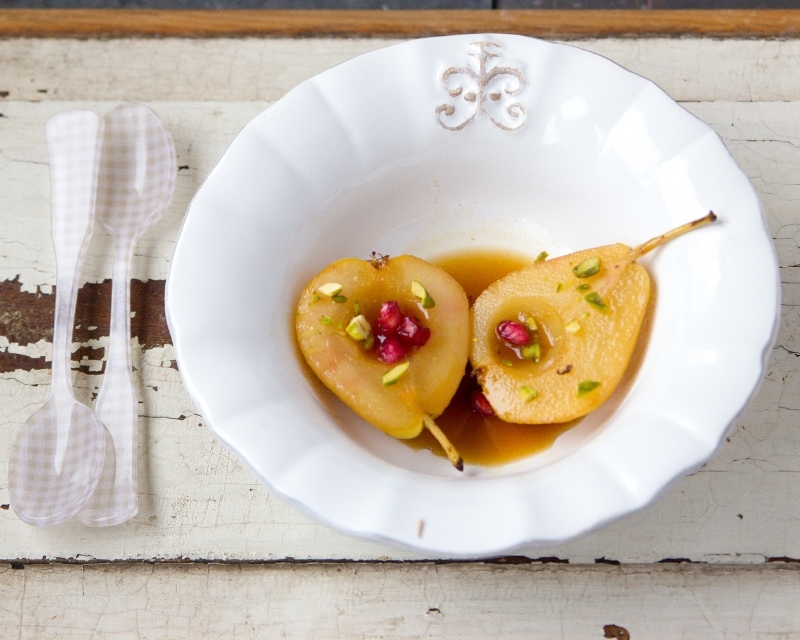 Pour a little of the basting liquid over the pears and sprinkle with fresh pomegranate seeds and chopped pistachios, if desired.